This is adapted from a lesson plan I prepared for my students. 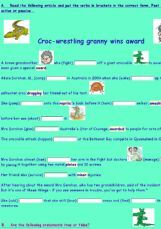 The exercises are based on an article taken from CBBC Newsround. 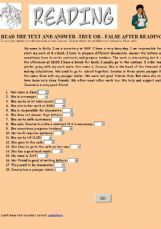 There is a gap-fill grammar exercise on the past tenses, a true / false comprehension exercise, a vocabulary matching exercise and a roleplay activity. 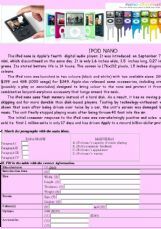 Reading comprehension task about iPod nano. 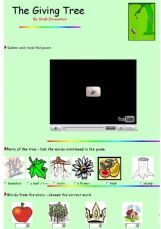 Animal Riddles 1a (Easy) - What am I? 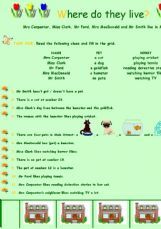 This is the online exercise version of one of my my Animal Riddles worksheet. There are ten animals in this exercise. Students need to read the description of the animal and click on what they think is the correct answer. Enjoy. 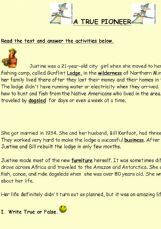 This is a very well known story useful to check comprehension made by Miss Adriana Esparza. Easy reading with cute animations.